Human Resources - HR, Compensation and Staffing tools are all delivered electronically. Internet and IT Positions Description HandiGuide Without good personnel no Information Technology organization can succeed. The first step in getting the right people is to know what roles and responsibilities they have. The Internet and IT Positions Description HandiGuide has this plus more. If you order the Word files for the job descriptions you will also receive the ePub version of all the job descriptions that can be viewed viewed via Kindle and eReaders on SmartPhones, tablets (iPad etc,) and PCs. To see the structure used for all of the job descriptions go Job Description Structure. 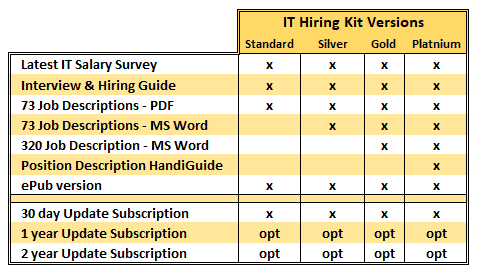 IT Hiring Kit - The must have tool kit for organizations and mangers who are looking to build a quality IT function. For more information go to https://www.e-janco.com/ITHirePack.htm. The kit, as welll as all other products, is delivered electronically as a "self-extracting" zip file. 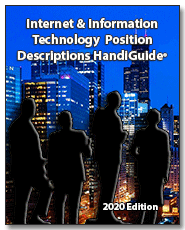 IT Job Family Classification System HandiGuide - This HandiGuide provides a step by step methodology and architecture to define job families and and align them with pay grades. The core of Janco's IT Job Family Classification System are four (4) IT specific career families, broad meaningful grouping of jobs commonly clustered within a career emphasis. To develop a functional set of classifications, the IT job family classification system provides the tools to identify the content of the task performed within a job which is the key criteria in determining the family into which a job falls. This process is how jobs are marketed in the recruiting process and conforms to how individuals and enterprises define overall career paths. Included in the HandiGuide is a template that has been proven to work in over 100 organizations world wide. A core IT Job Family Classification is included along with operational tools to layer the levels within each of the defined job families. Information Technology Salary Survey - Janco collects IT salary and benefit data on a continual basis and publishes that data twice a year. Once in January and a second time in June.